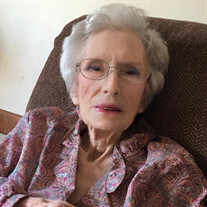 Edith Hopper Cordell, age 90, of Rutherfordton, NC, died Tuesday, April 25, 2017, at Hospice House of Rutherford County. was the world's greatest cook. She loved gardening, making quilts, collecting tea pots and crocheting. Three Grand-daughters: Lisa Parker and her husband Joe of Bostic; Sharon Cordell of Rutherfordton; Laura Hillman and her husband Richard of Ellenboro. Five Great-Grandchildren: Ashley Parker, Deanna Parker, Phillip Cordell, Austin Cordell and Jacob Cordell. The family will receive friends from 6:00 PM to 8:00 PM, Thursday, April 27, 2017 at McMahan's Funeral Home. The Funeral service will be at Sulphur Springs Baptist Church at 11:00 AM, Friday, April 28, 2017 with Reverend Ron Wilkins and Reverend Ad Hopper officiating. Interment will be at Sulphur Springs Baptist Church Cemetery. The family will be at Edith's home. Online guest register available at mcmahansfuneralhome.com. McMahan's Funeral Home & Cremation Services in charge of arrangements.